The control of catalysts aging is a critical step for the preservation of their properties. This is particularly true for bimetallic nanoparticles, where the composition may change during the catalyzed reaction. While so far the observations on the stability of the catalysts were essentially performed « post mortem », that is to say, after use, we have followed individually by scanning tunneling microscopy (STM) the evolution under oxygen of Au-Cu nanoparticles supported on TiO2 (110). These experiments demonstrate the direct link between stability and Au composition : while pure copper particles dissociate under O2, bimetallic particles comprising at least 20% Au are stable. This effect is explained by the local state density modification of Cu atoms induced by Au. Two key points have enabled us to obtain these results. First, we have measured individually the composition of the particles, and, secondly, we have followed simultaneously four regions of the sample corresponding to Au, Cu, Au-Cu particles and the bare surface. The particles have been monitored from their synthesis up to their exposure to low oxygen pressure (up to 10-5 mbar) and, for exactly the same experimental conditions for all compositions. 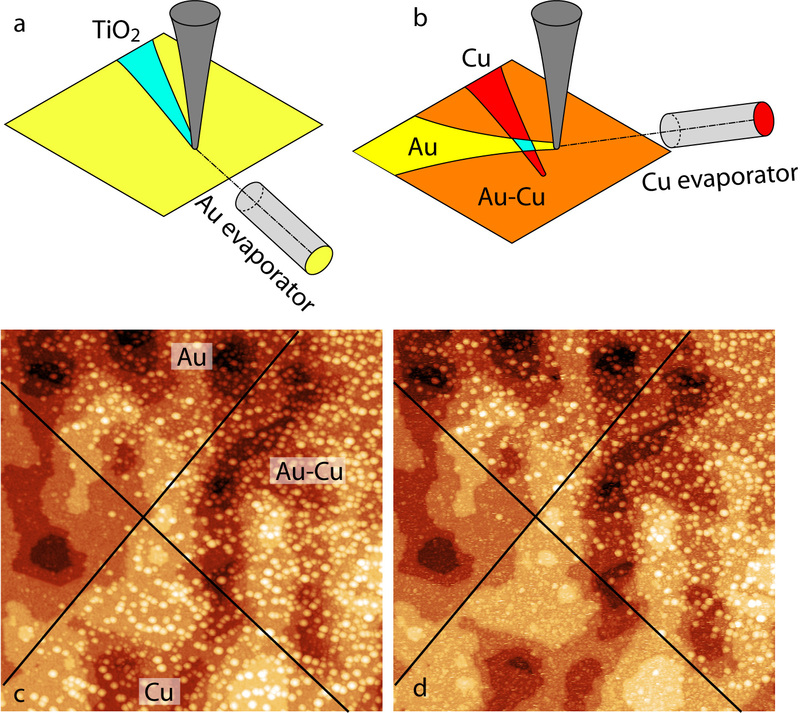 To do this, we have successively evaporated gold and copper, leaving the tip of the microscope into contact with the surface (Figure 1a and b). This creates two shadow cones on the surface where no Au or Cu is deposited, and so, four distinct regions on the sample (Figure 1c). The composition of the particles can also be found from the height - measured precisely after evaporating Au and after evaporation of Cu - and morphology - previously determined by X-rays diffraction/diffusion on the SIXS beamline of SOLEIL synchrotron. For measurements as accurate as possible, specific tools for the analysis of STM images were specially developed. Schematic drawing of the successive evaporation under STM tip of Au and Cu (a and b). Scanning tunneling microscopy images of the particles obtained at the end of evaporation (c) and under 10-5 mbar oxygen (d), at the intersection of the shadow cones. Figure 1d shows that, after exposure to 10-5 mbar O2, Cu particles have completely disappeared, while Au particles and particles of mean composition Au40Cu60 are stable. Au atoms have thus a stabilizing effect for bimetallic particles exposed to oxygen. They prevent Cu atoms to leave the particles and form Cu atom - oxygen complexes on the TiO2 surface. 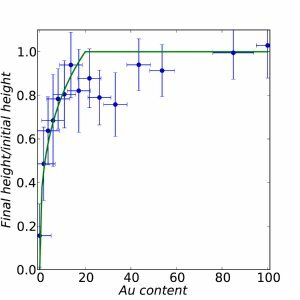 To accurately determine the effect of gold, we have synthesized Au-Cu particles of variable composition. To do this, the STM tip was moved during the evaporation of Au so as to create a gradient composition around the shadow cone. The observation of the particles after oxygen exposure show that they remain virtually unchanged if their Au content is greater than 20%, regardless of their size (see Figure 2). Below this critical composition, particle height decreases, and some particles disappear, reflecting the loss of Cu. We can estimate the final composition of the remaining particles : it is on average Au20Cu80. This result can be easily interpreted : particles where the Cu content is greater than 80% lose Cu atoms until the Au20Cu80 composition is reached. It remains to determine the cause of this stability. X-Ray diffraction and photoemission measurements performed on the SIXS and Tempo beamlines of SOLEIL synchrotron provide additional information : under oxygen, Cu segregates to the surface of the particles. So we can exclude a protective effect of a gold layer on the surface. The explanation is to be found in the local density of electronic states : alloying with Au modifies the position of the Cu d band. It is then further from the Fermi level, which causes a decrease in the probabilities of dissociative adsorption of oxygen and formation of a Cu atom-oxygen complex. 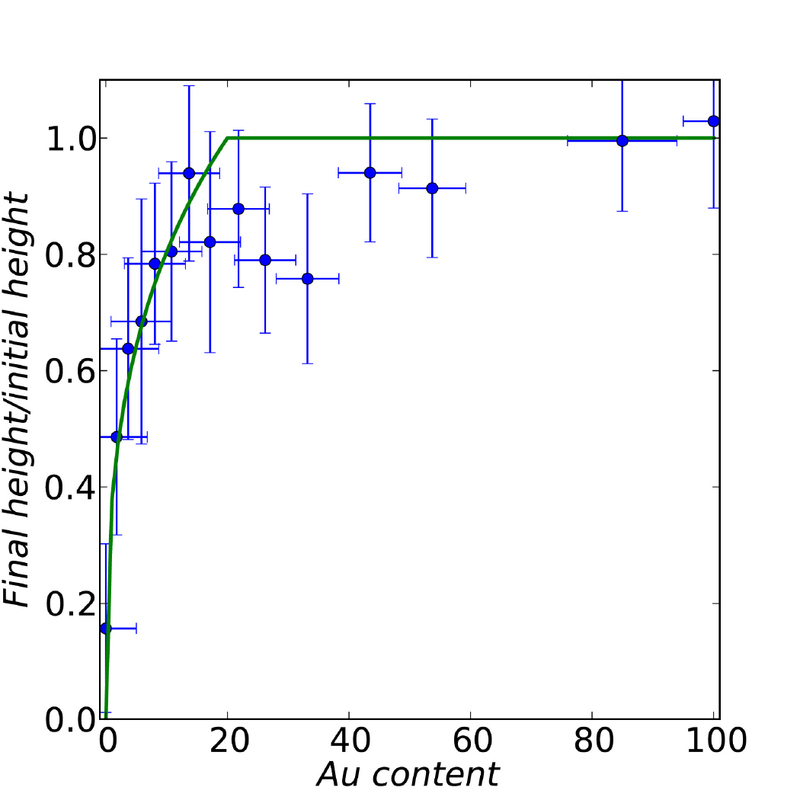 Relative height evolution of AuxCu100-x under 10−5 mbar oxygen. Each point correspond to an average on many particles. The continuous curve is the theoretical evolution for particles that lose Cu atoms up to the Au20Cu80 critical compositon. These results are a milestone in the study of the evolution under reaction of metal alloy catalysts. In addition, we study the catalytic properties of these Au-Cu particles for the oxidation of carbon monoxide. In collaboration with D. Loffreda (ENS-Lyon), the ab-initio modeling of supported nanoparticles and their evolution under gas is also underway. The detailed understanding of the alloying effects on the stability and reactivity of nanoparticles could help to provide a more rational design of catalysts for the future. Traitement quantique de l’information : jamais sans défaut ! De l’or pour stabiliser les catalyseurs ! Dynamique de solidification biphasée : flottante ou ancrée ?